The Define Nano S Solid Panel is an ITX case that features compatibility with high end, full-size components, superior sound dampening, and an ATX-like layout. Equipped with Fractal Design's signature ModuVent™ technology on the top vents and sound dampening throughout, the Define Nano S can run a powerful system quietly, a hallmark of the Define series. 12.99" x 7.99" x 15.75"
Easy-to-clean filters on the bottom and front, spanning the PSU position, with the bottom filter ejecting from the front for easy-access. 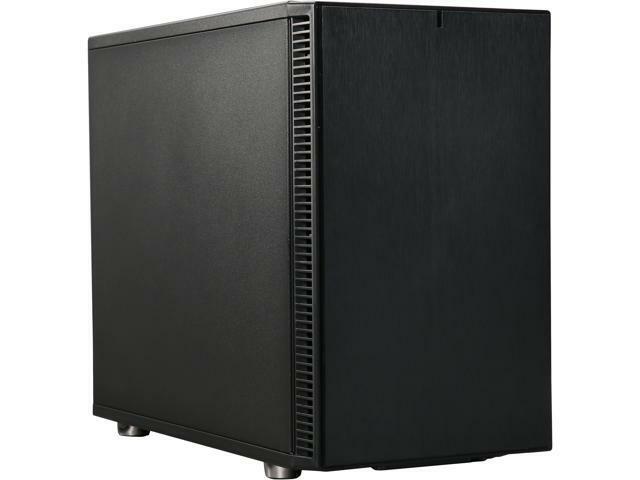 Pros: Small and compact, noise-dampening foam, plenty of fan mounts, comes with two fans pre-installed, SSD/HDD mounting brackets are a great feature that more cases could use. Gotta love the panel screws that don't detach. Helps make my living room quieter than some other cases I have had in the past. Fits an ATX PSU and 300mm GPUs with case fans installed. Cons: Somewhat limited cable routes, you're basically restricted to the rubber grommet escapes to your motherboard. Be careful about what video card you choose, 2.5 slot GPUs may not fit. My card is a 2 slot card and has about 1-2 cm of clearance between it and my ATX PSU. Case fans blowing horizontally across the card brought my temps down by 10 C roughly since one fan on the GPU doesn't have a lot of free space below it. Other Thoughts: Blower style cards might perform better in this case if you could find a quiet one. * Removable and easy to clean dust filters. * Buttons and i/o are on top, making it suitable for placing on the floor. * Cable management is easy in this case. * Blower GPU recommended, as the power supply may block some of your GPU fans. Other Thoughts: * More of an "average" sized case than a "mini" case. Other Thoughts: I have had this for over one year for my main PC build, and it has worked great. Pairing this with Noctua fans makes for a quiet PC. Pros: Overall the case is well made, very quiet -- my configuration I did not need to use the top fan installation. I did not install a radiator. Paint is clean, overall appearance is neutral. Its not WOW but it is not OUCH either. Vendor provided is a real manual with detailed instructions. 3 eggs because it is a clean case and functional for ITX mobo. Rubber feet. Real I/O blank off plates - not the bend and snap off style. Cons: Lots of confusing features on this case. Clearly the PLUS is you can design your own water cooling system. It is the real reason to buy this case. If you are not installing a custom reservoir and tubing you end up with 4 inches of unnecessary length to the case. All the drive locations have no drive overhang so there is no way to install cables unless you buy straight cables and adapt them to your power supply - sata - molex back to sata (or molex). This is probably the worst misfire in the design. An obvious issue will the be the front dust filter hold downs breaking off after you remove the front panel (over and over) to clean the filter. The front panel is held on by plastic legs that clip into holes in the case -- I have seen this style hold down break after two removals and installs with other cases. Top blank off should be two panels so there is no gaping hole if you decide to use only ONE fan. Other Thoughts: The case to buy with this design is the Window Version NANO S to show off a custom water reservoir and tubing -- and hopefully your nice LED accent lighting. 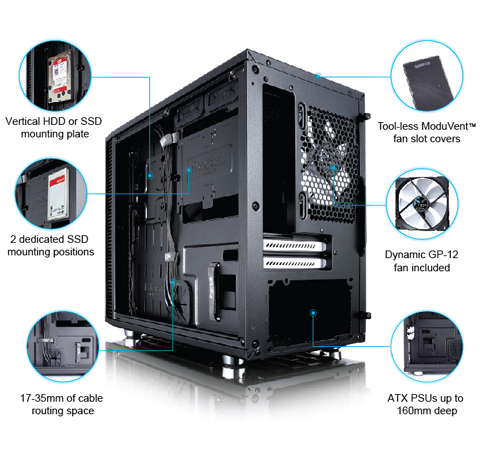 More money but otherwise there are other smaller ITX cases with better drive locations and cabling design features. I do not like captured bolts in the side panels -- not necessary and I do not find them handy. Pros: - One of the best-looking computer cases I have ever owned. - Excellent build quality, the metal feels heavy and thicc. - No ugly glass side panel. No stupid RGB lights. - Very simple, sleek, rectangular build. - Completely black exterior and interior. - Very quiet, even with my PC having 5 fans. 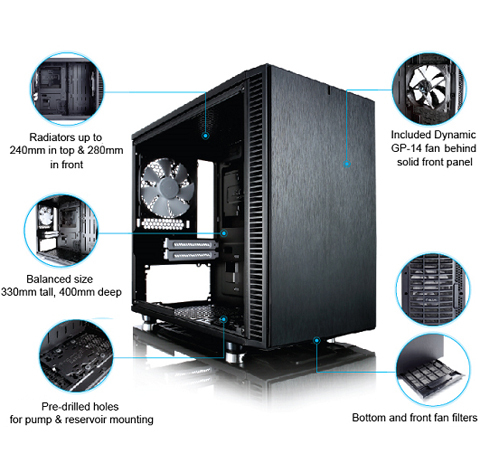 - One of the few mini-ITX cases that doesn't have an integrated power supply. - Power supply mounts on the bottom of the case. - Removable dust filters on the bottom and front. - 2.5-inch drive mounting bracket on the cable management side of the case. - Two USB 3.0 Front Ports. Cons: - This case was much larger than I thought it would be, on the inside and out. It's almost the same size as a mid-ATX case. Despite everything I love about this case, I wish it was even smaller. - As other reviewers mentioned, the space between a standard power supply unit and the graphics card is quite small, approximately a quarter-inch or smaller. This isn't a huge deal for me as the most graphically intensive game I play is Skyrim and PlayStation 1 and PlayStation 2 emulators, but just-in-case, I made sure my graphics card was long enough to include a second fan or a blower-style. If you're planning on playing more graphically intensive games, you may want to take this into consideration before you buy this case. - The rubber inlets that are used for cable management are a little flimsy and popped out a few times when running cables. - The power LED is a bright blue, not ideal for sleeping in a dark room. - When putting Windows 10 to sleep, the Power LED blinks on and off at approximately half-second intervals. It was annoying, so I ended up just disconnecting the Power LED cable from the motherboard. - The case fans have white blades while the rest of the case is black. Other Thoughts: - As a longtime Mac user, Apple spoiled me with their gorgeous, clean computer designs, so finding a PC case that meets my design standards is always a challenge. I spent weeks sifting through all the ugly cases the entire computer case industry produces, and narrowed my search down to just FIVE cases on all of Newegg. This case is great for people who are switching from Mac to PC for the first time, or even just first-time PC builders. - Every PC case manufacturer should just make cases based off of this case. - I love this case so much that I bought a second one. Cons: The power supply will block any fans on a graphics card unless you get a blower style. - Dust covers everywhere except for the removable top cover? Other Thoughts: Really could use a top mesh dust cover in addition to the solid top. Seems like there is a lot of wasted space up front where the PSU could have been placed to make the case smaller. Overall, it's not perfect, but the price makes it a very attractive buy. The only side of the case that feels "cheap" is the top with the removable cover. Every other side is well constructed and has a good feel to it. At the end of the day I feel like I got my money's worth and more. It's not a $200 case where I'd expect everything to be perfect.